Scientists have identified the oldest known bee, a 100 million-year-old specimen preserved in amber. 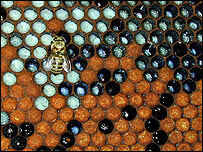 The discovery coincides with the publication of the genetic blueprint of the honeybee, which reveals surprising links with mammals, including humans. The ancient insect, trapped in tree sap, is at least 35-45 million years older than any other known bee fossil. It appears to share features with both bees and wasps, and supports theories of bee evolution. Experts believe pollen-dependent bees arose from carnivorous wasp ancestors. With the arrival of pollinating bees, flowering plants blossomed on Earth. Prior to 100 million years ago, the plant world was dominated by conifers which spread their seeds on the wind. George Poinar, professor of zoology at Oregon State University, US, whose team reported the discovery in the journal Science, said: "This is the oldest known bee we've ever been able to identify, and it shares some of the features of wasps. "But overall it's more bee than wasp, and gives us a pretty good idea of when these two types of insects were separating on their evolutionary paths." 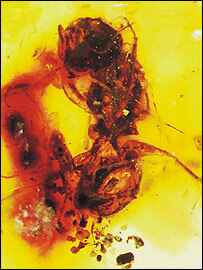 The amber specimen, from a mine in the Hukawng Valley of northern Burma, has been named Melittosphex burmensis. It has waspish features, such as narrow hind legs, but also branched body hair and other characteristics of bees. The fossil bee is in remarkable condition, with individual hairs preserved on undamaged portions of thorax, legs, abdomen and head. Legs and wings are also clearly visible. In terms of size it is tiny, measuring barely 3mm across. This is consistent with evidence that some of the earliest flowers were also small. Professor Poinar added: "This fossil may help us understand when wasps, which were mostly just meat-eating carnivores, turned into bees that could pollinate plants and serve a completely different biological function." There are now around 20,000 species of bees, which use pollen to feed their young. Scientists have also published the genetic blueprint of the western honeybee Apis mellifera. The honeybee is the fourth insect to have its genome sequenced, after the fruit fly, mosquito and silk moth. Locked within bee DNA there are striking links with mammals and humans, scientists discovered. Like humans, honeybees spread into Europe from Africa, making at least two ancient migrations. They split into two genetically different European populations which, according to DNA evidence, are more closely related to African honeybees than to each other. Honey bees have an internal "biological clock" which is more like those of mammals than of flies, the research has revealed. The clock governs many activities, including time sensing, navigation, labour division, and the famous bee "dance language" which the insects use to communicate information about food sources. Another group of scientists from the University of Illinois found 36 genes in the honey bee brain, 33 of which were previously unreported. They coded for 100 neuropeptides - organic molecules that control brain activity in both bees and humans, the researchers report in Science. In the bee brain, which is not much larger than a full stop, they help to regulate around one million neurons. The honey bee was estimated to have around 10,000 genes in total, less than the fruit fly and mosquito. Honey bees have many more genes relating to smell than fruit flies or mosquitoes, but far fewer involved with taste.